XLerateHealth is proud to announce that we’ve been selected as a finalist in Greater Louisville Inc.’s annual Inc.credible Awards, which honor top small businesses in the local community. In addition to our nomination in the Lifelong Wellness and Healthcare Innovation category, XLerateHealth has a chance to win this year’s People’s Choice Award! Please visit greaterlouisville.com/peopleschoice to cast your ballot for us today (we are the last company listed in the alphabetical drop down menu). You can share this graphic on social media to encourage your friends and family to vote as well. eBlu Solutions (Louisville, KY) is a platform providing workflow-driven services to streamline the complex processes that specialty medical practices face while navigating a patient to treatment. Services include real-time Benefit Investigation, as well as management of Prior Authorization and manufacturer Co-Pay Assistance workflows. eBlu supports practices in providing a better patient care experience, decreasing the time to treat while mitigating the financial risks a practice faces in providing in-office infusion. Epikardis Medical (Nashville, TN) is a medical device ideation and development company. Founded by a registered nurse and a mechanical engineer, Epikardis aims to create products that carry robust clinical and financial incentives. Their first product under development is a chest tube stabilization device that is expected to enter the market in 2017. Medic-Air (Louisville, KY) is a portable cooling device designed for children who suffer from the upper airway infection known as croup. The device is easy to use and on-demand, instantly producing an ambient temperature drop of 50 degrees to help shrink the airway inflammation the virus causes. Orthopedix (Providence, RI) is a 3D-printed orthopedic implant company that creates personalized, patient-specific implants throughout the body. The implants are individually sized and shaped to fit to each patient’s unique anatomy, offering benefits not achievable with “off-the-shelf” orthopedic implants. OR Link (Lexington, KY) is a mobile healthcare software company focused on redefining communication in and around the operating room. At its core, the unique software platform aims to simplify the process by which a surgeon’s “preferences” (for everything from surgical instruments to operating room layout) are stored, shared, and utilized in real time between all the personnel in the OR. Additional features include peri-operative scheduling management and surgical education. Solas Operations (Toronto, Canada) uses a Raman spectroscopy based diagnostic for early, non-invasive identification of gout. Solas’ novel gout diagnostic is able to identify gout early in asymptomatic patients, which is superior to the other two methods currently used (ultrasound and clinical exam for diagnosis) which identifies gout only after the disease has progressed and the patient is symptomatic – which makes it much harder to treat. In addition to the Chairman & Co-Founder of XLerateHealth Robert Saunders, a seasoned venture capitalist who has worked with more than 100 startup companies over the past two decades and has mentored several healthcare startup enterprises, fellow XLerateHealth co-founders include Ted Smith, a successful healthcare entrepreneur, former Senior Advisor for Innovation in the Office of the National Coordinator in the U.S. Department of Health and Human Services in Washington D.C., and Jackie Willmot, who has over three decades in the healthcare innovation and startup space, spending 15 years at Humana and the past 7 years working as a Venture Consultant with healthcare startup companies. XLerateHealth has received sponsorship support from the Kentucky Cabinet for Economic Development – Office of Commercialization & Innovation, Louisville Metro Government, The U.S. Small Business Administration (SBA), Mountjoy Chilton Medley, Old National Bank, and ID&A Office and Interior Design. Supporting venture capital sponsors include Kentucky Enterprise Fund/KSTC (Lexington), OCA Ventures (Chicago), TriStar Ventures (Nashville), River Cities Capital (Cincinnati), and Chrysalis Ventures (Louisville). In kind sponsors include Frost Brown Todd and Argi (formerly OPM Financial). XLerateHealth’s partners include Louisville’s Cardiovascular Innovation Institute; Johns Hopkins Health for America; The National Space Biomedical Research Institute; and The Nucleus Innovation Center. For more information, please visit www.XLerateHealth.com. Our fourth startup cohort is well underway, and we’re thrilled to see the progress that our companies have already been making. Check out some of the press that the accelerator has received so far this season, and stay tuned for updates about our startup Demo Day, which will take place on Oct. 27. MedCity ENGAGE is the country’s premier forum for the latest strategies and innovations to advance patient engagement. The 4th annual ENGAGE conference will be held from October 18-19, 2016 in San Diego, CA. ENGAGE will advance the patient engagement discussion, providing fresh insights into what’s working and what’s not in today’s healthcare ecosystem. You can check out this year’s agenda at this link. Be sure to register today, using our partner code XLERATE for 40% off the cost of your tickets! We are so proud to announce that XLerateHealth was just named a winner of the US Small Business Administration’s Growth Accelerator Fund Competition! This award was established in 2014 “as a way to make new connections and strengthen existing bonds within America’s small business support network, bringing entrepreneurs and innovators together and connecting them with local and national resources that support small business job creation and growth.” This is the third consecutive year that XLerateHealth has earned this honor. We look forward to putting the $50,000 cash prize to good use as we continue mentoring our fourth startup cohort. Congratulations to the 67 other Growth Accelerator Fund Competition winners, especially Chef Space, a kitchen incubator headquartered in our hometown of Louisville, Kentucky! XLerateHealth is proud to be a Community Partner for IdeaFestival 2016, an annual celebration for creative thinkers and the intellectually curious, held this year from Sept 27 – 30 at the Kentucky Center for the Performing Arts. IdeaFestival is an eclectic network of global thinkers and one-of-a-kind innovators bound together by an intense curiosity about what is shaping the future of the arts, business, technology, design, science, philosophy and education. Please visit www.ideafestival.com for more information and use the exclusive code SAVE10 for a 10% discount off your Festival Pass! iClinical (San Francisco, CA) is a real-time data aggregation and analytics platform for clinical trials. The real-time trial insights and built-in collaboration tools allow faster issue resolution and decision-making, so that life-saving drugs get to the market sooner and at a lower cost. iPillBox (Louisville, KY) is a mobile pill organizer that streamlines complicated medication schedules for patients and allows caregivers and physicians to monitor compliance securely. iPillBox enables providers to access real-time data through a secure web-application so that they can proactively manage medication compliance issues. Inscope Medical Solutions (Louisville, KY) has developed a Wi-Fi enabled multi-purpose, disposable laryngoscope that optimizes airway intubation by integrating several devices into one easy-to-use device. This innovative technology addresses a $1.2B laryngoscope market and will improve this high-risk procedure’s speed, effectiveness and safety. MedUX (Toronto, Canada) revolutionizes surgical workflow by bringing the surgeon, direct, tactile control over digital case data while in the operating room’s sterile field. For the first time, surgeons can easily access the data they need, where they need it most. NormaLyte (Louisville, KY) is a clinically proven sugar-free oral rehydration salt product specifically created by pharmacists to quickly and effectively treat dehydration without the salty taste of competitors’ products (e.g. : Pedialyte) and without the hydration efficiency loss of sugar-based hydration products (e.g. : Gatorade). The proprietary formula is based on the World Health Organization’s recommended formula, which has undergone extensive evaluation and testing by the scientific community. NormaLyte is much more easily consumed by patients, athletes, etc. than salty alternatives which are compliant with the WHO sugar-free standard. SYSGenomics (Granger, IN) provides molecular diagnostic tests to enable cancer patients and their oncologists to select the most effective treatment strategy. SYSGenomics takes the guesswork out of cancer treatment. Trajectory Healthcare (Loveland, OH) is a population health analytics solutions company that helps evaluate, improve and design population health management programs. Using its patented analytics engine and easy to use software, Trajectory transforms how customers see and manage their population health data, helping them make better clinical and financial decisions. In addition to Saunders, a seasoned venture capitalist who has worked with more than 100 startup companies over the past two decades and has mentored several healthcare startup enterprises, fellow XLerateHealth co-founders include Ted Smith, a successful healthcare entrepreneur, former Senior Advisor for Innovation in the Office of the National Coordinator in the U.S. Department of Health and Human Services in Washington D.C., and who now serves as the Chief of Civic Innovation for Louisville Metro Government, and Jackie Willmot, who has over three decades in the healthcare innovation and startup space, and spent more than 15 years as an executive with Humana. Supporting XLerateHealth is a world-class group of mentors. The mentors provide guidance and counsel to XLerateHealth’s portfolio companies, drawing from their depth of experience in healthcare and business creation. Mentorship can range from providing a single phone call for advice to a much more intensive interaction depending on the needs of the company and the time commitment of the individual mentor. Startup companies will typically have two to five mentors with whom they engage on various aspects of their business. Mentors in the accelerator have extensive experience in various aspects of the healthcare ecosystem and/or various aspects of early-stage new venture creation. XLerateHealth has received sponsorship support from the Kentucky Cabinet for Economic Development – Office of Commercialization & Innovation, Louisville Metro Government, The U.S. Small Business Administration (SBA), Mountjoy Chilton Medley, Old National Bank, and ID&A Office and Interior Design. Supporting venture capital sponsors include Kentucky Enterprise Fund/KSTC (Lexington), OCA Ventures (Chicago), TriStar Ventures (Nashville), River Cities Capital (Cincinnati), and Chrysalis Ventures (Louisville). In kind sponsors include Frost Brown Todd and Argi (formerly OPM Financial). XLerateHealth’s partners include Louisville’s Cardiovascular Innovation Institute; Johns Hopkins Health for America; Innovate LTC; The National Space Biomedical Research Institute; and The Nucleus Innovation Center. XLerateHealth (XLerateHealth.com), a Louisville-based accelerator for early-stage healthcare companies, announces that it has been selected by the U.S. Small Business Administration (SBA) as one of the 80 winners of the second annual Growth Accelerator Fund Competition. The recipients represent 39 states, the District of Columbia and Puerto Rico. XLerateHealth was also selected in 2014 as a recipient of the SBA Growth Accelerator Fund, and is one of a handful of accelerators chosen both years. The SBA announced the winners yesterday at the White House Demo Day. Bob Saunders, Chairman of XLerateHealth commented, “We are delighted to receive this recognition from the White House two years in a row and the award will help support our work with our third annual cohort of companies who just began this week. Our seven new XLerateHealth 2015 startups are an impressive group of young companies who will showcase their businesses at our “Demo Day” on October 29, 2015. In addition to the SBA, XLerateHealth has received sponsorship support from the Kentucky Cabinet for Economic Development – Office of Commercialization & Innovation, Louisville Metro Government, Mountjoy Chilton Medley, Old National Bank, and ID&A Office and Interior Design. Supporting venture capital sponsors include Kentucky Enterprise Fund/KSTC (Lexington), OCA Ventures (Chicago), TriStar Ventures (Nashville), River Cities Capital (Cincinnati), and Chrysalis Ventures (Louisville). In kind sponsors include Frost Brown Todd and Argi (formerly OPM Financial). XLerateHealth’s partners include Louisville’s Cardiovascular Innovation Institute; Johns Hopkins Health for America; Innovate LTC; The National Space Biomedical Research Institute; and The Nucleus Innovation Center. For more information, please visit www.XLerateHealth.com. MidAmerica Healthcare Venture Forum, held April 22-23, 2014 in Chicago, is the best place to learn about opportunities to invest in the thriving technology and innovation community that characterizes the Midwest. This important conference unites active investors with corporate business development executives to facilitate investment opportunities with promising Mid-America based start-ups. You will have the chance to hear from and interact with leading healthcare experts and startup companies spanning the medical device, diagnostics, health IT, regenerative medicine, agri-health, and biopharmaceuticals sectors. Save $400 (35%) off the registration fee now with our partner code XLERATE. Find out more about the event and register here. This event is produced through the collaborative efforts of MedCityNews.com and the Mid-America Healthcare Investors Network (MHIN), making MidAmerica Healthcare Venture Forum the destination healthcare investing conference in the Midwest. You won’t want to miss it. Blue Sky Case Management (Louisville, KY) is a conflict-free social service agency for Medicaid waiver participants living with Intellectual and Developmental Disabilities (IDD). Blue Sky’s mobile, SaaS-based tools help case managers produce plans of care that deliver better home and community-based services for consumers with IDD. Count It (New York, NY) pioneers highly social, inter-company challenges, and automates the connection between corporate charitable giving and employee wellness. Powered by a push-button reward platform and utilizing mobile activity sensors (e.g. : FitBit, Jawbone, Shine, etc. ), the service dramatically lowers the cost and administrative complexity of conventional wellness programs. Gyroskope Family Network (Louisville, KY) is an online content, gaming, and social platform built for the aging population. The technology streams classic TV shows, movies, radio and other programming on-demand. The platform also offers video and audio experiences and activities that enhance memory and cognition, as well as other features designed to connect aging individuals to their family and friends and keep them engaged and mentally active. Lift3D (Columbus, OH) (pronounced “lifted”) empowers athletes, patients, trainers and wellness providers with real time movement data and analysis, in order to effect better outcomes and lower costs. Lift3D provides individuals using equipment in fitness facilities with real time actionable data and tracking of their activities. LIFT3D utilizes 3D laser based imaging technology, which provides fitness facility owners with a low cost way to attract and retain the growing segment of data oriented members. Medbiomarkers (London, England) is a web platform seeking to accelerate the discovery, validation and utility of biomarkers for health monitoring, diagnostic and therapeutic applications. Via its biomarker database and social network, Medbiomarkers strives to be the leading destination online for lifescience companies’ biomarker related data requirements and partnership building needs. Myliance (Louisville, KY) has developed the nation’s first Resident Care at Home Concierge Model (RCaHC). Myliance works outside the walls of traditional brick and mortar facilities by providing end-to-end personalized services for the aging in place and disabled populations. Concierge services include both medical and non-medical services. NeuroAtlas (Louisville, KY) is developing medical software that utilizes 3D non-contrast MR imaging (MRI) to detect and develop comprehensive analyses of several neurological disorders (including an initial focus on early diagnosis of Autism). Personal Medicine Plus (Paducah, KY) is a mobile health platform addressing underserved Medicaid and rural populations. The software app is designed to help people with chronic conditions such as pre-diabetes and pre-hypertension engage and better manage their health. The technology uses connected health device data and gamified behavior tracking presented in an easy to use and visually appealing screen. Supporting XLerateHealth is a world-class group of mentors. The mentors will provide guidance and counsel to XLerateHealth’s portfolio companies, drawing from their depth of experience in healthcare and business creation. Mentorship can range from providing a single phone call for advice to a much more intensive interaction depending on the needs of the company and the time commitment of the individual mentor. Startup companies will typically have two to five mentors with whom they engage on various aspects of their business. Mentors in the accelerator have extensive experience in various aspects of the healthcare ecosystem and/or various aspects of early stage new venture creation. XLerateHealth receives sponsorship support from the Kentucky Cabinet for Economic Development – Office of Commercialization & Innovation, Louisville Metro Government, Mount Joy Chilton Medley, and ID&A Office and Interior Design. Supporting venture capital sponsors include Kentucky Enterprise Fund/KSTC (Lexington), Triathlon Ventures (Cincinnati), TriStar Ventures (Nashville), OCA Ventures (Chicago), and Chrysalis Ventures (Louisville). In kind sponsors include Frost Brown Todd and OPM Financial. XLerateHealth’s partners include Louisville’s Cardiovascular Innovation Institute; Johns Hopkins Health for America; Innovate LTC; The National Space Biomedical Research Institute; and The Nucleus Innovation Center. For more information, please visit www.XLerateHealth.com. As part of our ongoing mission to foster innovation in healthcare, the XLerateHealth team will be in attendance at Louisville’s own IdeaFestival 2013, and we’ve got a 10% discount lined up for friends and fans of your favorite healthcare technology accelerator. When the time comes to purchase your IdeaFestival passes, just enter the promo code 10IF to receive a 10% discount. Why would anyone want to start a healthcare company in a town best known for horse racing, baseball bats and fried chicken? Simple: Louisville, Kentucky has quietly become a hotbed of healthcare innovation and entrepreneurship, and anyone wanting to build a business in the healthcare space would be wise to set down roots in this economic ecosystem. To the right, you’ll note a rather interesting graphical rendering of the Louisville Healthcare Family Tree. Each dot on the graphic represents a unique healthcare-related business that was founded and continues to operate in Louisville. Capitalizing on the talent and resources drawn to the region by giants like Humana, Kindred Healthcare and the University of Louisville, literally hundreds of thriving healthcare enterprises have been created in the Derby City. The same proximity to the majority of the US population that drew the UPS Worldport to Louisville — 75 percent of the US population is accessible within a two-hour flight — makes the city a natural nexus for healthcare logistics. Twelve of Louisville’s top 25 largest employers are healthcare enterprises, meaning both talent and facilities are already present and accessible. You don’t have to relocate healthcare equipment, employees or expertise to Louisville. You need only present a healthcare idea that takes advantages of the burgeoning healthcare resources that are already here. Why bring a healthcare startup to Louisville, KY? The better question is: why bring a healthcare startup anywhere else? One of our directives at XLerateHealth is to be a part of the larger conversation about the future of health and wellness, which is why we make it a point to attend a selection of cutting-edge health-related conferences. Case in point: MedCity ENGAGE and MedCity CONVERGE. If you’re looking to meet the minds behind XLerateHealth — to say nothing nothing of the leading companies, organizations and scholars in the health and wellness ecosystem — ENGAGE and CONVERGE are the places to be. Best of all, when you register to attend MedCity ENGAGE and CONVERGE, XLerateHealth can get you in for half price. Just use the discount code XLERATE during registration and you’ll enjoy a 50% discount on the at-the-door admission price. ENGAGE is a premier forum for the leading strategies and innovations to advance patient engagement with care providers and the healthcare ecosystem. The event is hosted by the Foundation for Healthcare Innovation. CONVERGE is a two-day, executive summit that will debate and discuss the leading trends, showcase the hottest startups and share best practices among some of the industry’s most innovative hospital systems and leading medical device, digital health, pharmaceutical and information technology companies. Members of the XLerate management team and several of our consulting Mentors will be in attendance at both events. We hope to see you there. 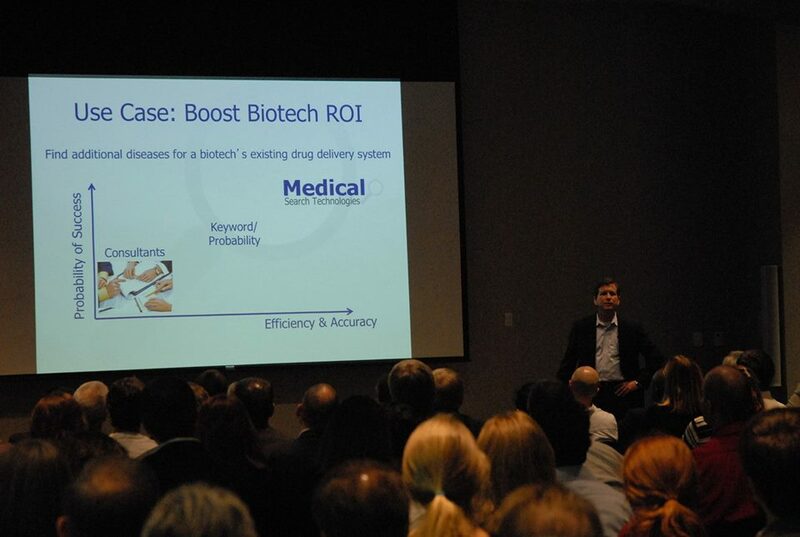 XLerateHealth held its very first Demo Day in the new Nucleus building with over 200 people in attendance. The 6 startups that participated in the accelerator gave their pitches to a host of healthcare professionals, investors, and academia. Mayer Fischer also spoke to applaud the entrepreneurial spirit that XLerateHealth’s first batch embodied. After the presentations, individuals had the chance to meet the entrepreneurs at their booths to get deeper insights into each of their companies. The enthusiasm and the interest of potential investors reinforced that XLerateHealth’s mission to mold successful, marketable business models in the healthcare arena. We look forward to seeing the legacy continue the next batch of startups.